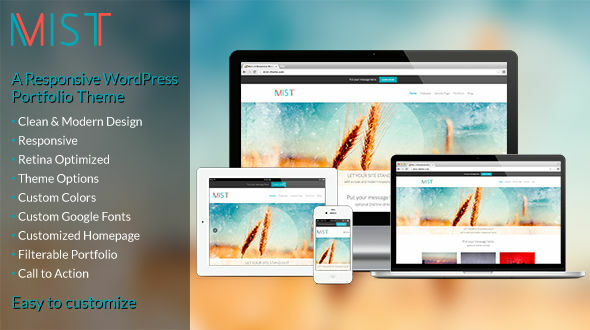 Mist is a responsive WordPress Porfolio theme. The clean, modern, and minimal design makes it perfect for any kind of creative, eco, business, or nonprofit use. It’s fully responsive and has been optimized for tablet and mobile platforms. It also is retina optimized to look incredible on high definition displays. 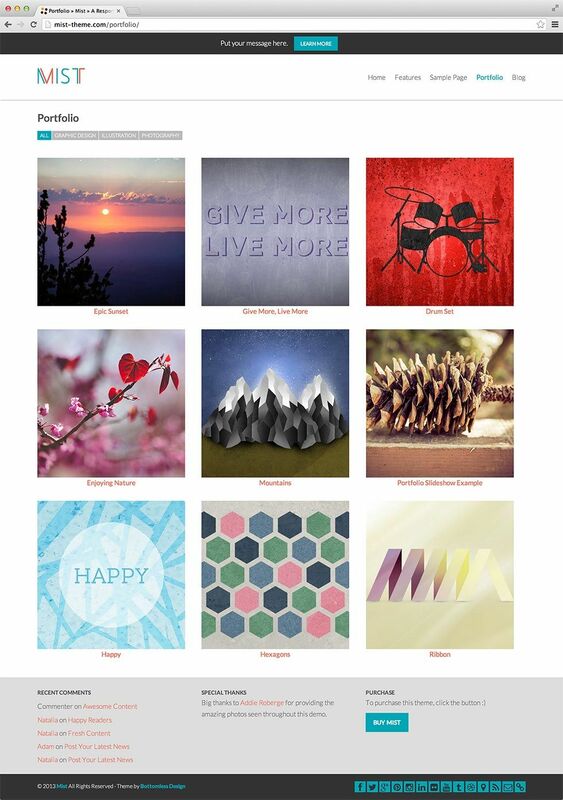 The portfolio can be displayed on the homepage and also has a filtered option on the main portfolio page. Featuring a Theme Options panel, Mist is amazingly easy to customize. Change colors, use Google Fonts, add custom CSS, and more. The homepage is fully customizable, with the option to use or hide many features. Additionally, Mist has a Call to Action feature that makes it easy to direct customers to your event, product, or newsletter signup. Make your next website project easy to realize and eye catching with the flexible and adaptive features of Mist. Mist is WordPress 4.1, 4.2, 4.3, 4.4 & 4.5 compatible. I downloaded the files, but why am I not seeing the mist.zip file? To upload via the WordPress Theme Uploader, you will need to use the mist.zip file. This file is located inside of the \\\\\\\"Mist - Theme and Documentation.zip\\\\\\\" file. Note: Attempting to use the \\\\\\\"Mist - Theme and Documentation\\\\\\\" zip file directly will result in a \\\\\\\"Missing Style Sheet\\\\\\\" error. 1. Login to your WordPress admin. 2. Go to Appearance / Themes (in the left menu). 3. At the top of the page, click the Add New button. 4. At the top of the next page, click Upload Theme, then click Choose File button to select a file. 5. Select the zipped theme file, mist.zip, and click Install Now. 6. After installation you will receive a success message confirming your new install. 7. Click the link Activate. In order to install, you must use the mist.zip file. Attempting to use any other file will result in a \"Missing Style Sheet\" error. On some computers, particularly on Macs, when the mist.zip file is downloaded, it may automatically open. Just look for the folder titled mist and compress/archive/zip it back up. By default, Mist will display your latest posts on the homepage. To use the homepage as seen in the demo, click the Add New button to create a new page. Name it either Homepage or Home. Then look in the far right column for the Page Attributes section and select Homepage from the Template drop-down menu. After creating the new page with the Homepage template, go to Settings / Reading (in the left navigation bar). 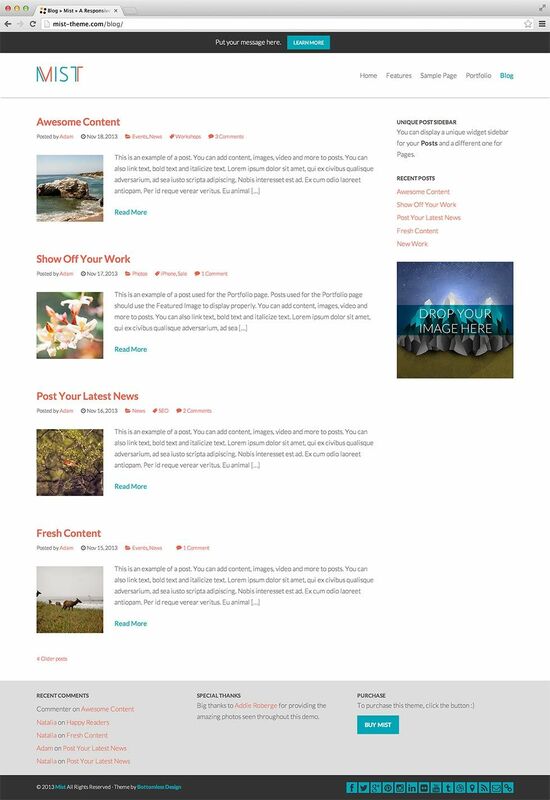 For Front page displays, choose A static page, and for Front page select the newly created Home page from the drop-down menu. Then click Save Changes. You can add and manage slides for the homepage slider by clicking the Slides link in the left menu. To add a new Slide, click Add New. Slides should be given a Title. Images for the slides should be entered in the Background Image section. The optimum size of the slider image is 1600px width x 800px height. To enter a Background Image, click the Upload button. You can drag and drop your image to the pop-up media uploader or click the Media Library link if you\\\\\\\'ve already added the image to your Media Library. When selecting an image, be sure to include a Link URL. (Note: due to the nature of background images, this won\\\\\\\'t actually create a link here, but leaving this field blank or set to None can sometimes create issues when uploading an image.) Once your image is selected, click the Use This Image button. 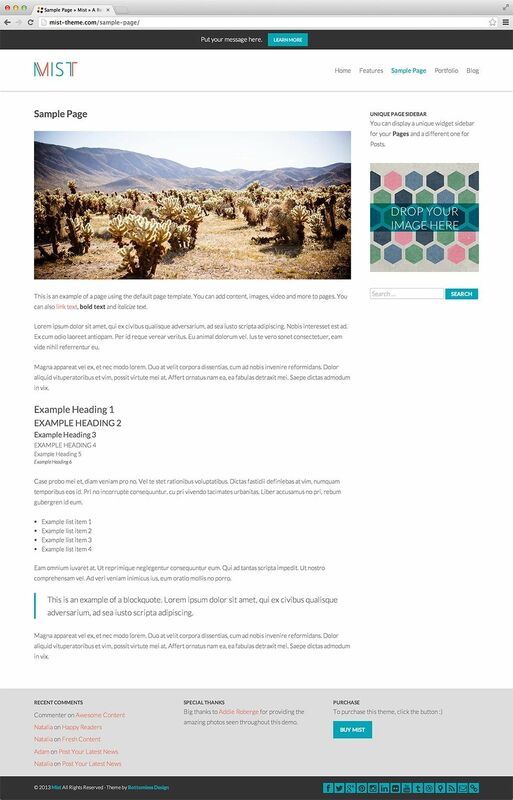 In order to view slides on your site, you\\\\\\\'ll need to have a page created with the Homepage page template and assign that page on the Settings / Reading page. See the How do I have a homepage like the demo site? answer for more details on creating your homepage. Once the homepage is properly set up, you can go to Slides in the left menu to add/edit/manage your slides. In order to view the featured pages on the homepage of your site, you\\\\\\\'ll need to have a page created with the Homepage page template and assign that page on the Settings / Reading page. See the How do I have a homepage like the demo site? answer for more details on creating your homepage. Once the homepage is properly set up, you can go to Appearance / Theme Options / Homepage to assign your Featured Pages. • Updated layout for when Portfolio is selected as the homepage. • Updated to latest version of Theme Options (v1.7.1) • Updated CSS styling for WordPress v3.8 • Adjusted image.php display options.